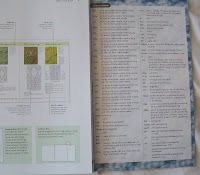 I have LOTS and LOTS of knitting books—a few pattern books, more technique books and the most stitch books. 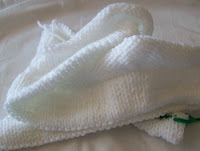 I love stitch collections—what ever they are called. 1—Clear (color) photographs, and clear explanations of how to use the book and some knitting basics. 4—Standard abbreviations, and easy to read symbols for the charts. I had a Barnes and Noble gift card ($25) burning a hole in my pocket---and I ended up buying the new Reader's Digest Book-The Essential Stitch Collection. 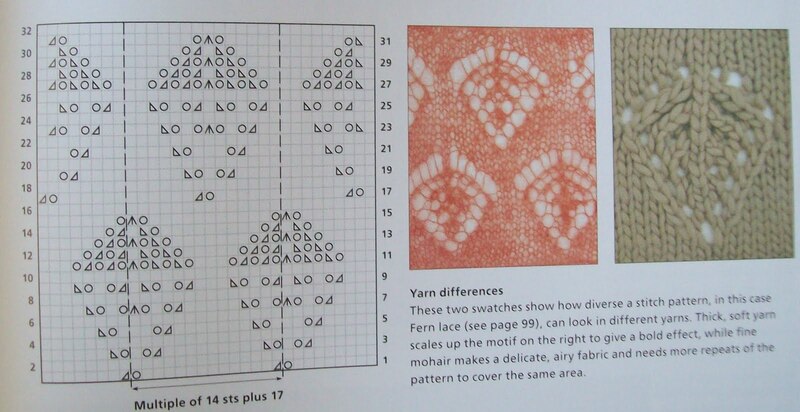 1—It has great photography—and in the intro, it has some very good information—I especially liked the example shown of a lace stitch—one version in a lace weight mohair, another in a smooth worsted—demonstrating how the appearance of a stitch pattern is VERY dependent on the yarn/gauge. 2 and 3—for almost every pattern, there are both written and charted directions. 4—A bonus! 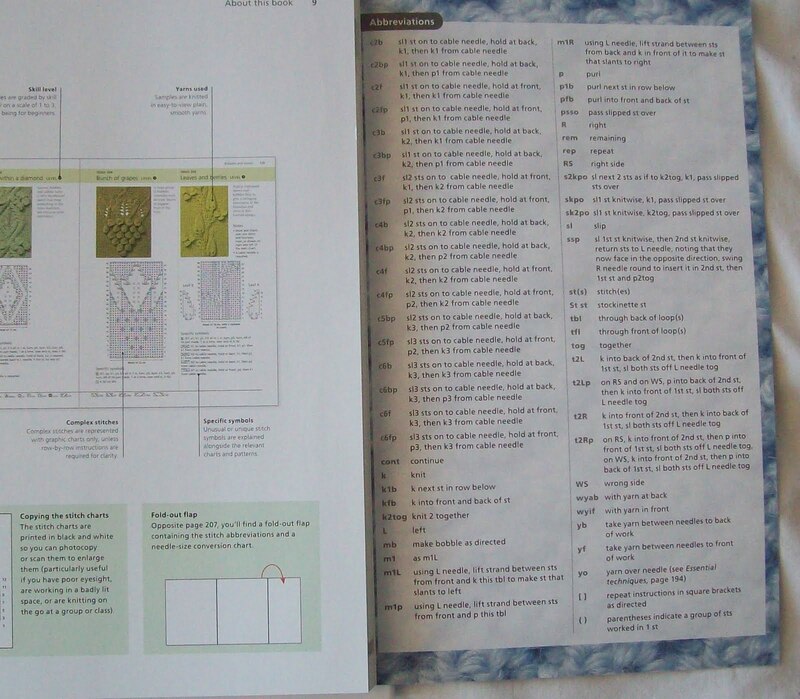 As a footer on each page, there is a guide to the symbols used in the pattern on the page! If I want to follow a chart, and it contains an unfamiliar symbol-I don't have to go back and forth from the pattern page to the index page,(which helpfully folds out.. so even if I do need to reference, I can do it with out flipping back and forth!) I can just check the meaning of the symbol on the bottom of the page. EVERY Book should provide this. This book has 300 well organized stitches, (some unique ones—NEW ONES to me—and I already own a dozen collections already!) and the book list at $24.95-($0.08 per pattern) but it is widely discounted to $15.99--(or $0.05 per pattern)--so it is a value collection. If this book were spiral bound (instead of a conventional binding) it would be perfect- as is, its nearly perfect! If you are looking for a good addition to your crafting library, this book is a good place to start! I am always experimenting—and trying out new ideas..sometimes, like my Leaf Me Alone hat—I have near successes, and eventually a real success. But lots of times, I have failures. Most just get frogged and forgotten about. Gone are the buttons and buttonholes (seen as green waste yarn) Added—a neck ruff and brim—and delicate, pretty shaping. It won't be finished for a while.. Other projects have more priority. Like my mystery project—FINALLY on to skeins 5 & 6 (just the first row ) but hey, its progress! Its just short of 14 inches--(of 19? 20? 21 inches?—i haven't decided yet on the final desired length) So it will likely need part of skeins 7 & 8—but not too much. Looks like a great book. Thanks for the recommendation.